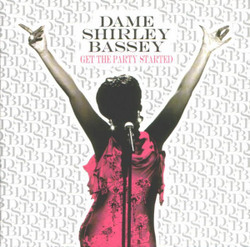 A sequel came into play after a Bondesque hit single "The Living Tree" and "Get the Party Started," an unexpected (to say the least) cover of the Pink song were made available promotionally. Dance remixes of each followed as did the full length album Get The Party Started. The album takes 70-year-old Bassey into the studio and re-recording a few of the vocals, as opposed to the first remix album, which used previously available recordings. The effort is appreciated, as the mixes get increasingly complex, without the need to mechanically stretch the songs, which may have been a bit more distracting that preferred for Diamonds's "Big Spender" and "If You Go Away". Her voice has never sounded better. Instead, we get lush and fascinating variations of Grace Jones' "Slave to the Rhythm" (mixed by the Glimmer Twins) and one of Bassey's non-Bond signatures "This Is My Life" (mixed impeccably by Cagedbaby). Comfortably fitting in as well are the lush "Living Tree," the rocking "Big Spender," (from NorthxNorthwest) the bossa nova sweetness of "Kiss Me Honey Honey," and the bombastic title song. Admittedly, the latter sounds like a novelty single, but at least it comes clean to that. An easy standout is the harrowing and dramatic "What Now My Love" as remixed by Bugz in the Attic which depicts Bassey's final loveless minutes. Not everything is as revolutionary, as "I Who Have Nothing" (recently brought back to the limelight by American Idol's Jordin Sparks) doesn't gain much from the '07 treatment (again from NorthxNorthwest), and "Where Is the Love" is fairly forgettable. "Can I Touch You There" is a bit too long, but in the right setting, you may never notice. Among the more high profiles remakes, Bassey puts her stamp on a flamenco "I WIll Survive." Gloria Gaynor is not going to be forgotten any time soon, but Bassey's cover is a straightfaced, fierce romp that never lets on that someone else had the nerve to record it first. Ditto that to Lionel Richie's "Hello" which is given a haunted, smokey feel; and Nancy Sinatra's "You Only Live Twice," which begs the question: when's Bassey going to release a Bond-only cover album and make a song like Tom Jones' "Thunderball" finally respectable? Download This: "Big Spender," "The Living Tree," "What Now My Love," "This Is My Life"